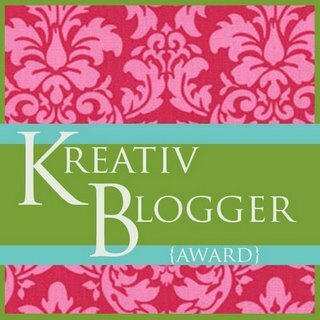 What a fun surprise to find out that a fellow blogger has nominated me for the Kreativ Blogger Award! Thank you to Nice Things In My Life for this honor. Thank the award giver and link back to them in your post—thanks again to Nice Things In My Life for nominating me! Award seven others and tell them about the award—since I’m relatively new to this blogging thing, I’m not sure if I can come up with 7, yikes! See below. 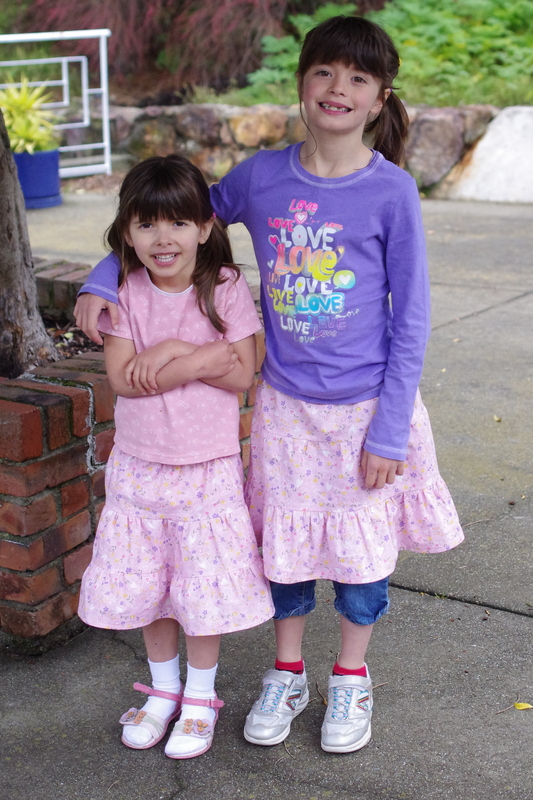 I learned how to sew, or at least the basics, in a middle school home economics class. The first project I ever made was an apron for my mom that I gave to her as a gift for mother’s day. I’ve lived in every state beginning with an “O”—Oregon, Oklahoma, and Ohio. I love 19th century British literature and was this close to pursuing an English PhD. Before becoming a stay-at-home mom, I was a high school special education teacher for three years. It was a challenging job but overall I enjoyed it. I hate to cook. I really wish I was one of those wives that has a wonderful home cooked meal on the table every night as my husband walks through the door, but that’s just not me. I do love to eat, though. Not a good combo! I used to be a really good runner. I ran cross country and track from middle school through two years of college. The funny thing, though, is I never really liked to run. I liked to compete but I was not one of those crazy addicted runners. I go through spurts where I run but I haven’t consistently ran since college. I have been a busy lady this week! 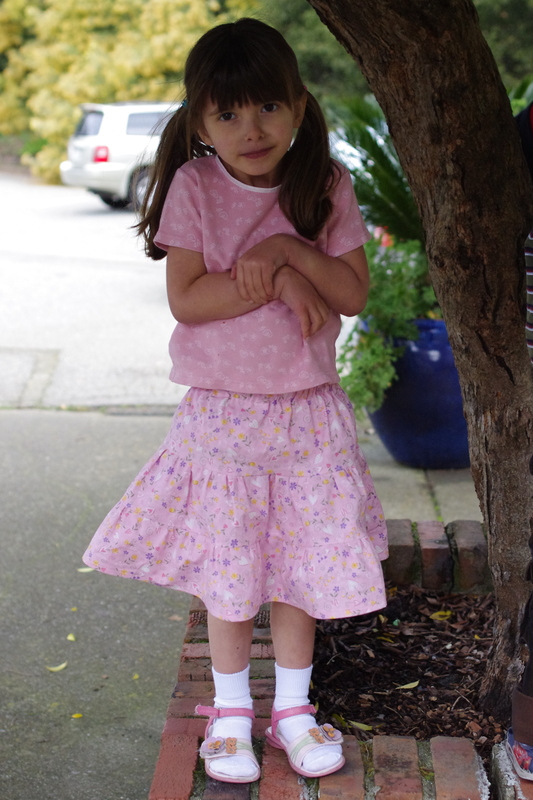 It sort of feels like I’ve been sucked up into an Easter sewing whirlwind. 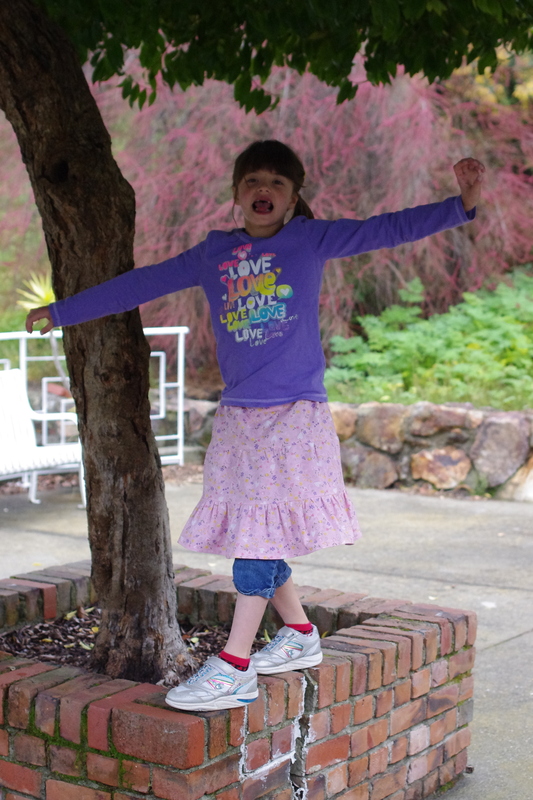 After I finish up a few details, I will have Hannah’s Easter dress and a little something I made for myself to share with you all. It’s a relief to have made such a sizable dent in my Easter projects list! For now, I have a follow up on the Easter bargains I found at Joann’s this past weekend. 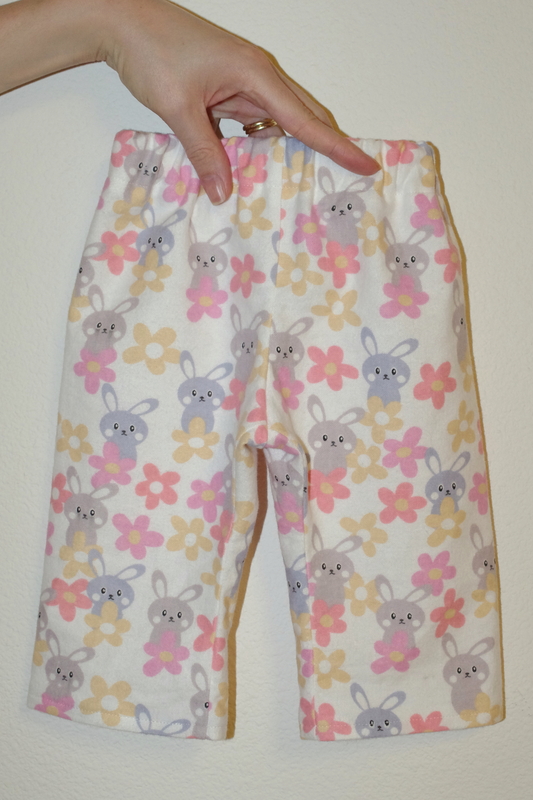 For starters, I made some Easter jammie pants out of the cute bunny flannel. 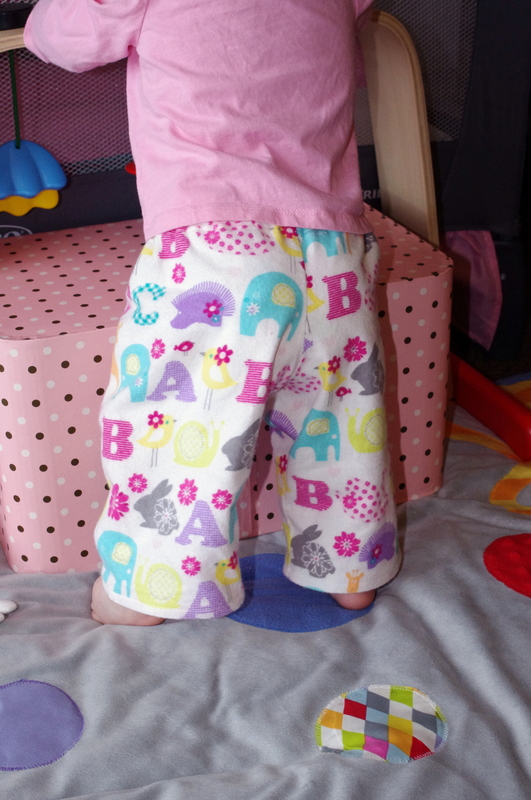 I slightly altered my pattern from the other jammie pants I made so that the legs were a little less wide and the crotch was a little more rounded for a better fit. 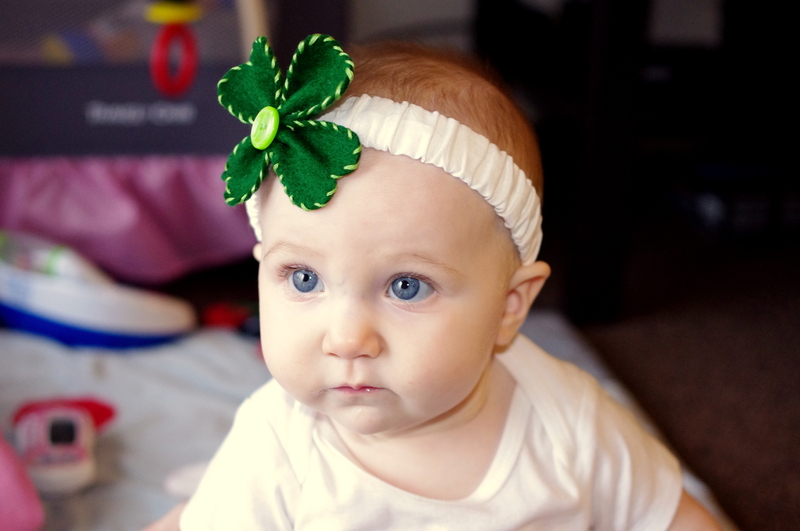 I can’t wait for her to wear them! I’ve been trying to figure out a way to incorporate the ribbon into Hannah’s Easter “basket.” (She’s actually not going to get a basket. Because she’s cruising all over the place and is eager to explore, I picked up a wagon walker from Ikea—among other things, I sort of went a little crazy—and I’m going to use the wagon as her basket.) 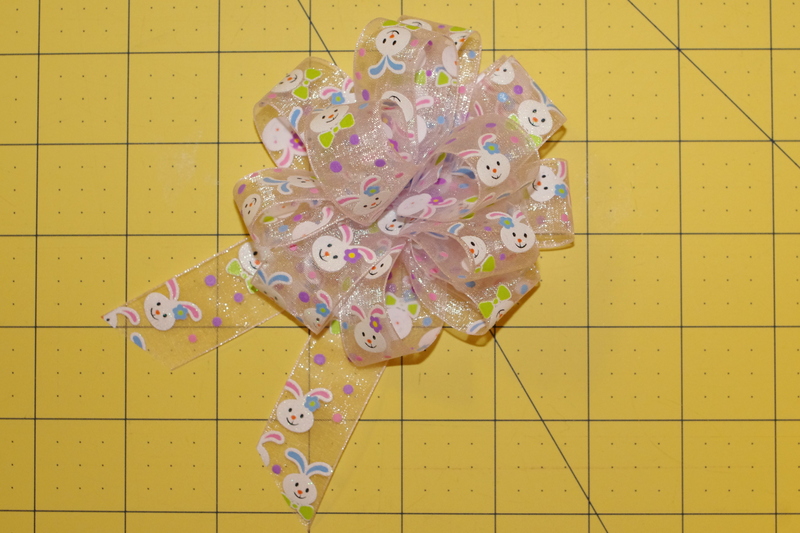 I used this tutorial to make a poofy bow out of the rabbit ribbon. 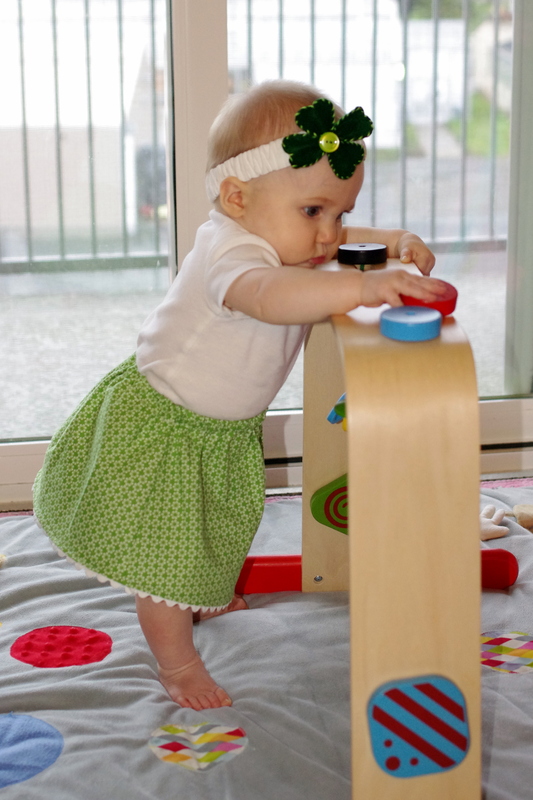 I’m going to put the bow on the handle of the walker. 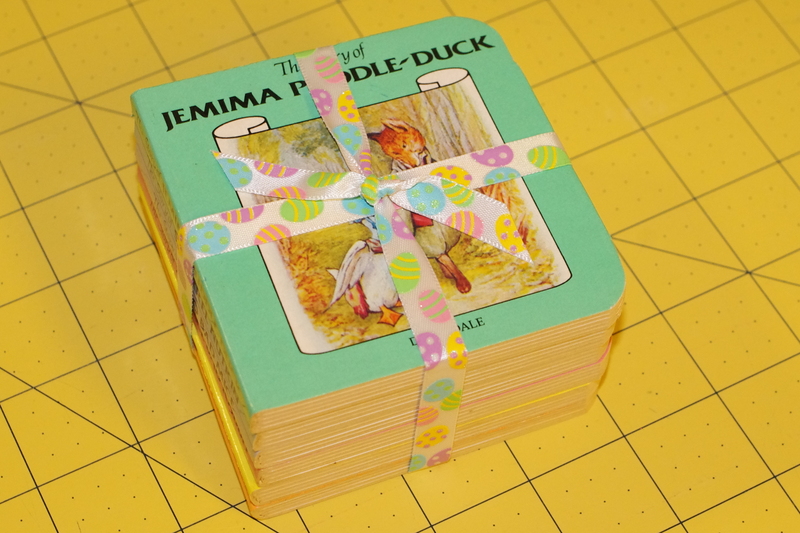 I used the Easter egg ribbon to tie a set of Beatrix Potter board books together. I’m excited for Hannah to have them because they were mine when I was a little girl. It’s so fun to pass down little treasures like these to my sweet girl. I haven’t gotten to the carrot ribbon (my favorite!) yet. I plan to make some sort of a bow for the rabbit stuffed animal that I also picked up at Ikea. When I get everything all put together, I will share how it all turned out. I hope that Hannah loves her first visit from the Easter bunny. 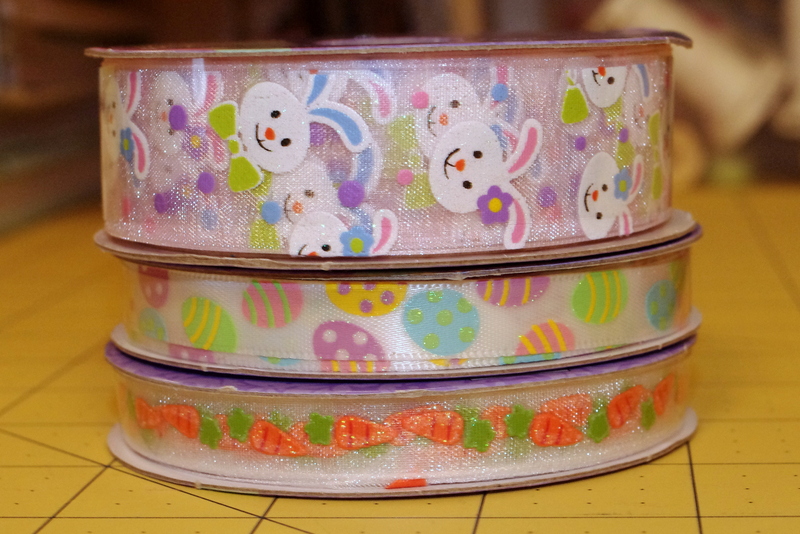 Today I went to Joann’s to pick up a few things and I ran across some Easter bargains I couldn’t resist. These three spools of ribbon were only 99 cents each. I don’t know what I’ll use them for yet but I’m sure I can come up with something. My favorite is the one with carrots! 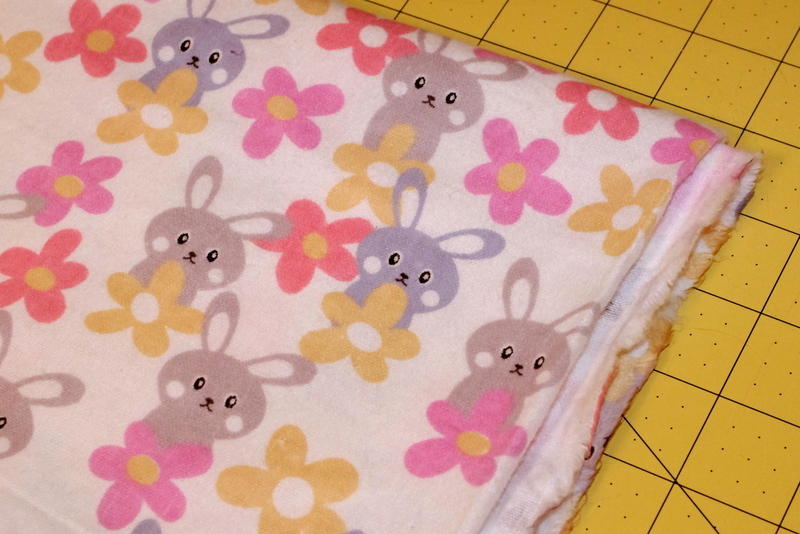 All snuggle flannel is on sale right now for $2.79 a yard, so I bought half a yard to make some cute Easter jammie pants out of these sweet little bunnies. While taking the little one to the library this past week, I decided to pick up some goodies for myself. 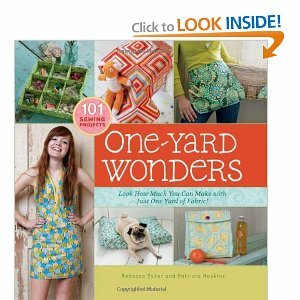 I absolutely LOVE the book One-Yard Wonders by Rebecca Yaker and Patricia Hoskins. There are so many great projects that use only one yard of fabric. Some of my favorite projects are: organized bed pocket, hanging laundry bag, hanging wall pocket, origami organizer, laptop sleeve, summer nightie, folklore bag, petite diaper tote, and newborn flyaway jacket. What I love is that this book has a little bit of everything. I also want to check out the previous edition, which I’m sure also has a bunch of amazing projects to add to my never ending list of things I’d love to sew if I ever find the time! 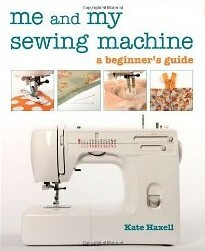 The book Me and My Sewing Machine: A Beginner’s Guide is such a great overview of everything you’d ever want to know about sewing from parts of the machine and accessories to seams to buttons and zippers to sewing with different types of fabric. 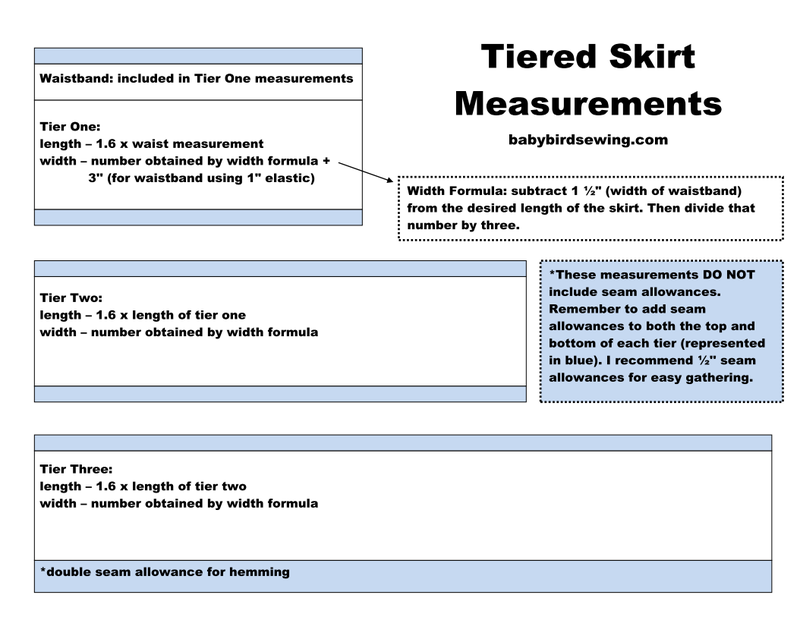 The descriptions are really simple and clear and the pictures are very helpful. I was also excited to see that the sewing machine is actually the one I own or one that is very similar. 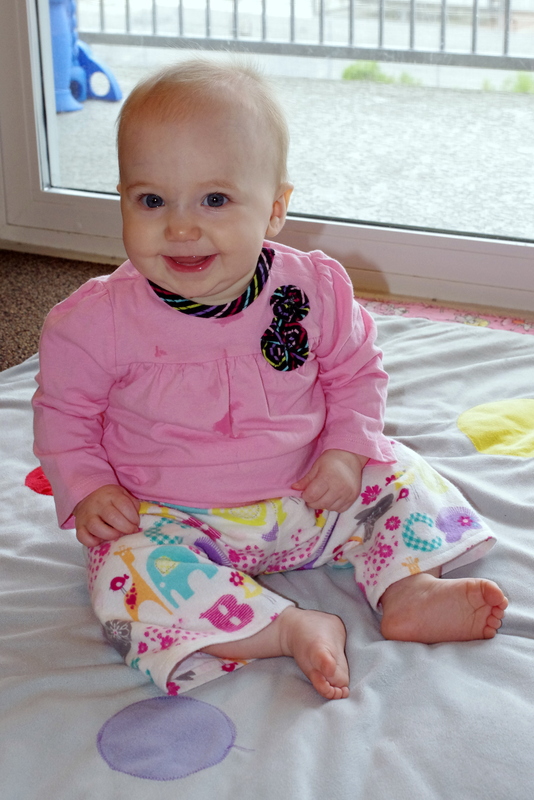 I’m loving Baby Knits for Beginners by Debbie Bliss. I taught myself to knit a few years ago. I made like a bazillion scarves and then sort of lost interest. (At the time I was living in Ohio where scarves are a winter essential. Now I live in sunny California and scarves are pretty useless.) This book looks like a great way to get back into knitting…if I can get motivated enough to put in the time to learn new stitches and to figure out the whole yarn weight/needle size/gauge situation. Some of the projects I love are: simple hat, jacket with seed stitch bands, seed stitch shoes, dress with eyelets, and scarf with pocket. So cute! 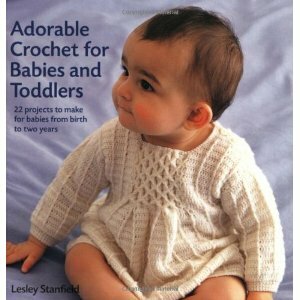 I’m not sure how useful Adorable Crochet for Babies and Toddlers will be for me. I’ve tried crotchet a few times but I just can’t get the hang of it. To be completely honest, I’m pretty much terrible at it! My biggest problem is getting the tension of the yarn right. This book is more of a dream than a reality at this point, but the three projects I would love to make are: small sandals, Richard Rabbit, and Barnaby Bear. If I could, I would make the rabbit for my sweet girl for Easter. Definitely not going to happen this year. Maybe next Easter?